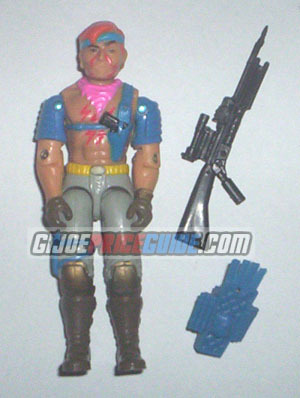 NOTES: Zandar's figure possesses the same color changing ability as his Dreadnok brother Zartan's. This means that the figure's torso is glued together and cannot be separated by removing the back screw. Therefore it is very difficult to repair a broken O-ring. The O-ring factor makes this figure slightly more difficult to find in good condition, but Zandar is not sought after by collectors because of his colors and boring accessories.